A main feature of Swedish media could be illustrated by a saying we have in Spanish, “Ser mas papista que el Papa” (Trying to be more Pope than the Pope himself” . The term indicates a phenomenon of extreme cultural subservience, and by which an individual’s or organization’s exaggerated defence of the interests of the authority the veneer, causes more problems to it than help. Or in further episodes neighboring the bizarre, it can cause even embarrassment to the entity ‘targeted’ by their idolatry. This was the case when US President Obama visited Sweden in his way to a conference he attended Russia, in an out of the schedule” program devised to fill a two-days gap after changing plans to visit Moscow. 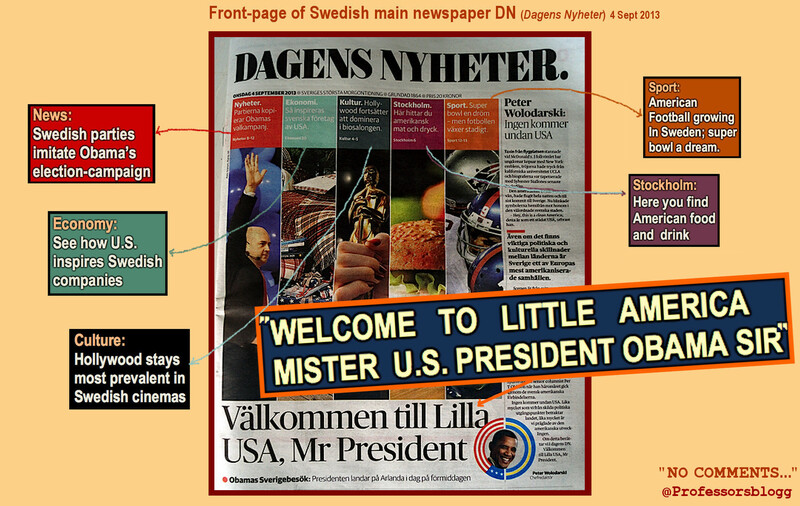 Now the Swedish media intends to be “more Americans that the Americans themselves”. Either these media believe that this is the right way to megaphone U.S. interests, or they have chosen being the spokesmedia of the most recalcitrant pro-war-vs- Russia hawks within the American political establishment. 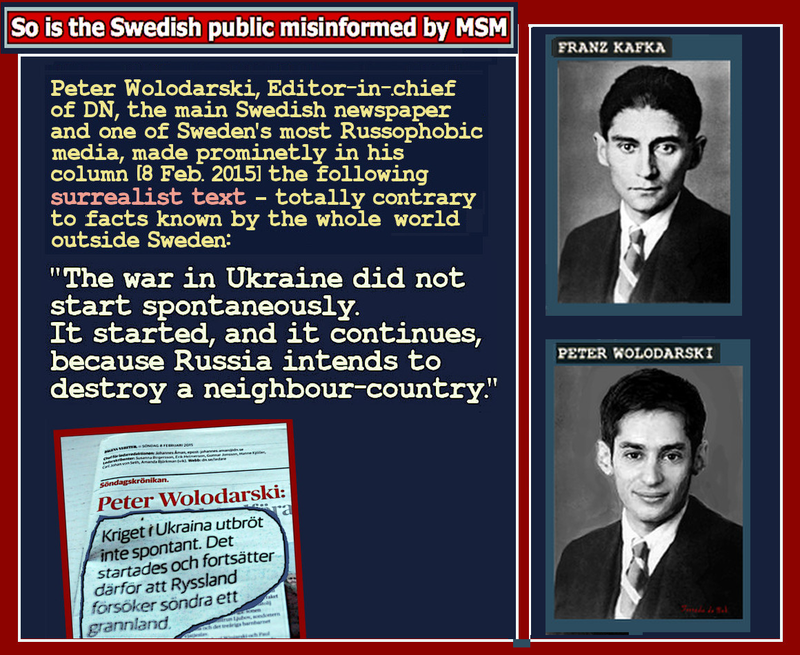 In fact, the blatant disinformation on the Ukraine conflict by Russophobic Swedish media, acts instead against Obama’s and the majority of EU governments’ interest in trying to find a diplomatic solution, and avert a furthering of the war. Swedish media is otherwise internationally reputed  principally for three things: a) It is total financed (so called public service TV and Radio, SvT and SR respectively), or partial financed with public funds (DN, SvT, Expressen, Aftonbladet, VK, etc), at the same time that the private big media is owned in the main by the Bonniers monopole. b) It is not prone to exercise criticism on the government foreign policy, neither to question in-depth politicians of right-win allegiance; c) it is devoted to lobby for Sweden to enter NATO and to megaphone in Sweden the international interest of Israel. Besides, notable programs aired at the Swedish TV are markedly racial in its form and content. With all, a new “personality trait” has emerged regarding the Swedish media, particularly Svt and DN but also many among the rest of outlets at the MSM. And that is a severe form of Russophobia syndrome. 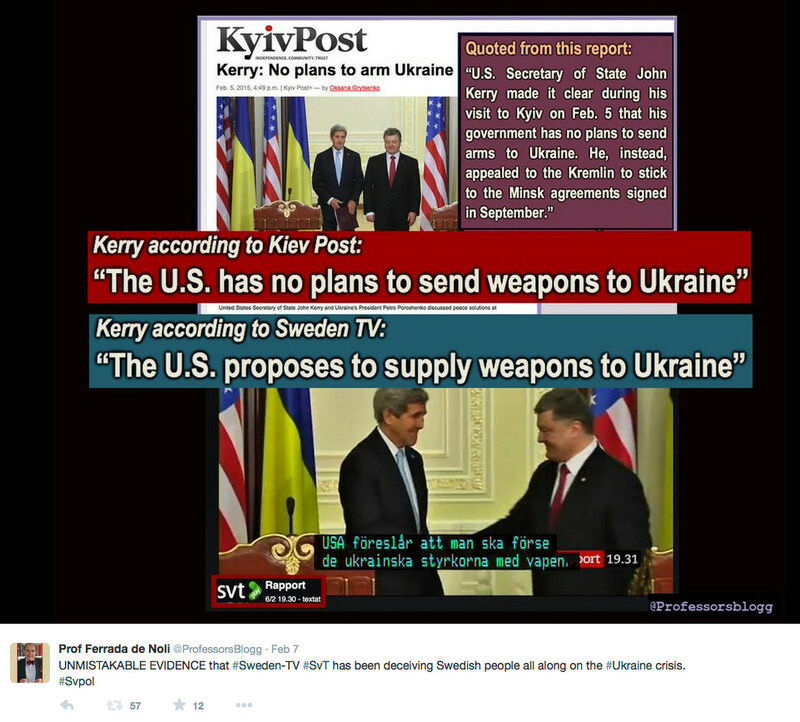 Blind by this Russophobia and by an overt-defence of the interests as expressed by the most right-conservative factions inside the US politics and the military establishment (the so-called hawks), the Swedish public service TV indulges now in a frantic, perverse twisting of facts about the Ukraine conflict. 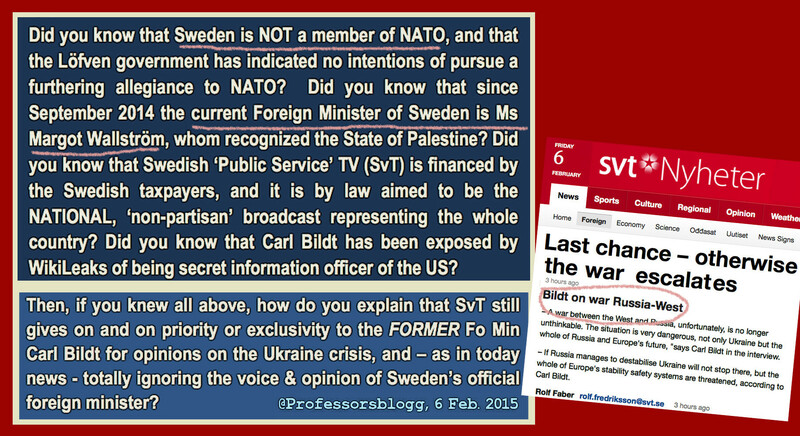 In fact, the SvT, SR, DN and partly SvD utterances are a simple reproduction of the line maintained by ex-minister Carl Bildt. As we can see in the image below, for these media Carl Bildt is still the one “calling the shots” admits what it looks as a fantasy world they might have of “Swedish WASPS” crusaders against “Anti-American Russian Communists”. Needless to say, DN has been staunch advocate of not only continue sanctions against Russia, but even asks on and on for an increasing of the sanctions. A main tenure has been the insisting on a military solution for the Ukraine conflict, for instance a whole-hearten support to the initiative for US and EU sending lethal weapons to Ukraine. This eagerness has made Swedish media blind to the point of lying mercilessly. Not a single mention to the fascist putsch in Kiev – instigated by the US Embassy in Kiev – and which occurred prior to the uprising in Donbass, prior the referendum, prior the occupation of buildings etc. Not to mention the open support (or instigating) to the fascist coup by the then Swedish foreign minister Carl Bildt. The participation of the US embassy in Kiev is fully documented and even spread in the Internet such as the videos uploaded in YouTube. Not a single word on the characterization of sub-humans that the population of Donbass had to hear from Yanutsenyuk, and which motivated the furthering of the resistance against what was considered a fascist tenure against the Russia-ethnic minority of Donbass. Not a single mention of the multiple massacres perpetrated by the Kiev forces and Nazi formations in Odessa, Mariupol, Luhansk, etc., long before the counteroffensives by NAF forces, principally in Donetsk. Etc., etc. And this is the report by the Swedish TV on the agreements between Chancellor Angela Merkel and President Obama which expressly meant to further try a diplomatic solution to the Ukraine conflict, and NOT sending the weapons advocated by for instance DN in a man editorial last week. 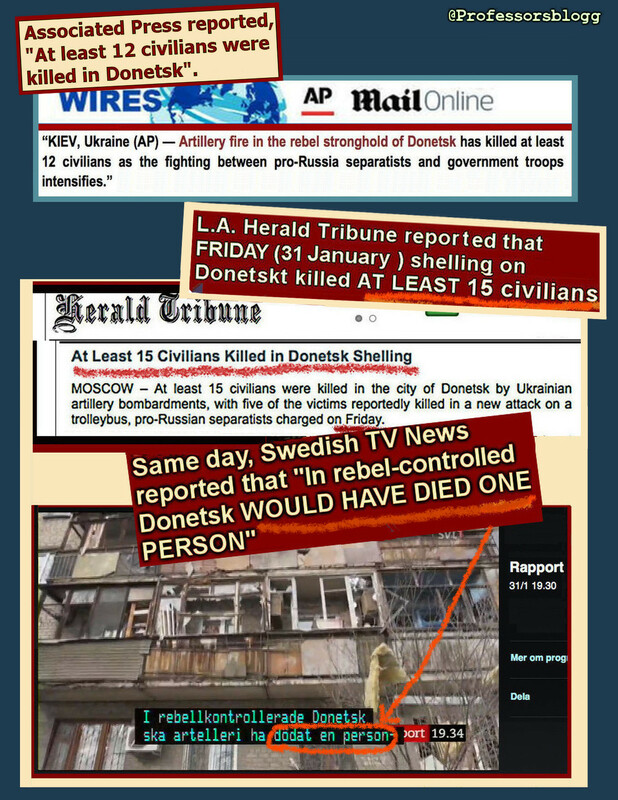 DN (Dagens Nyheter) has conducted in the last days a frantic campaign dismissing as “Troll” the denouncing in social media of the war atrocities committed by the Ukraine army on the Donetsk civil populations. As for instance exposed recently in War Crimes in Ukraine. 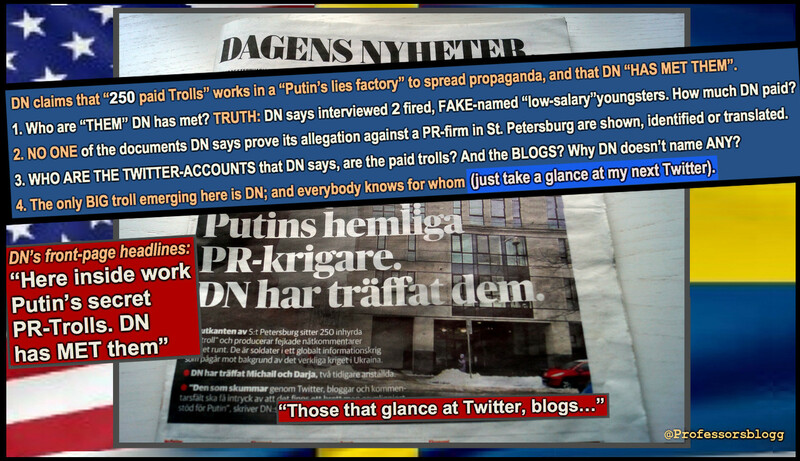 Some examples of the Swedish MSM and “public service” TV and Radio anti-Russia are given in this separate article. I refer for instance to an article published in the Washington post: Craig Whitlock, “New Swedish Documents Illuminate CIA Action”. Washington Post, 21 May 2005. “Analysing The Swedish Phenomenon Of Political Consensus”, at page 78; “Media Paradox And The Case Against Assange”, at page 83.